Calling all Bartenders and Bar Owners!! The moment you’ve all been waiting for – Step right up! Registration is now open for the 2019 Sexiest Bartender Contest happening on May 12th during the RipplePHX Spring Carnival Weekend! We’re looking for 12 of our community’s favorite bartenders to compete in this year’s competition! Showcase a Signature Drink! Slay with a Talent on the Sideshow Stage! Bring that Community Spirit! Fundraise for the cause! You’ll be able to take home the ultimate community bragging rights of being this year’s Sexiest Bartender! Registration Deadline is Thursday, March 21st. Calling all Beverage Enthusiasts! 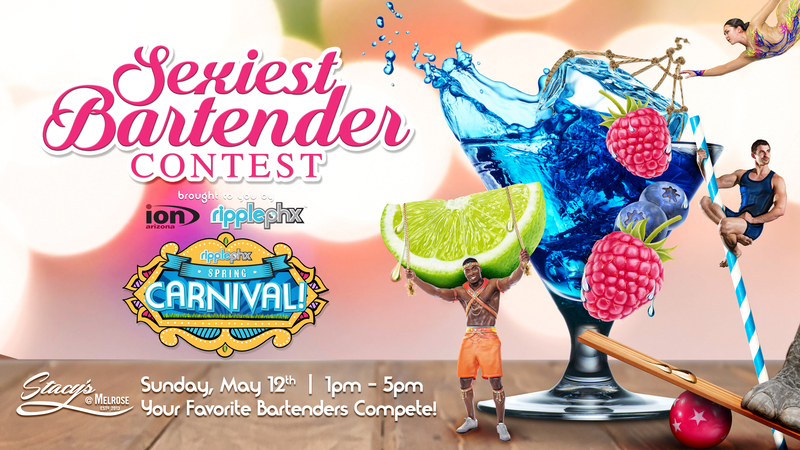 Save the date for this year’s Sexiest Bartender Contest – Sunday May 12th from 12pm – 6pm at the RipplePHX Spring Carnival Weekend! Sample 12 of your favorite bartenders’ Carnival-Themed Drinks, watch them SLAY with talent from the Sideshow Stage, and witness their love for the community as they come together to compete for the ultimate title of Sexiest Bartender! Nothing’s sexier than a bartender with hella Community Spirit! Save the date! More details, participating bars and contestants coming soon!